Yesterday, shortly after Microsoft announced the Lumia 950 and Lumia 950 XL, AT&T confirmed that it would launch the 950 in the US (possibly starting November). Since no other carrier revealed plans to sell any of Microsoft's two new smartphones, we were wondering if the 950 was an AT&T exclusive. Thankfully, it's not. According to CNET, the deal between Microsoft and AT&T to sell the Lumia 950 "is not an exclusive one", which means that we might see the handset offered by other US carriers at some point. Of course, might plays an important role here - we don't know if the 950 will actually be sold by anyone else except AT&T and Microsoft. The Lumia 950 and 950 XL are the world's first smartphones to run Windows 10 our of the box. The former is the smaller among the two, thanks to the fact that it has a 5.2-inch Quad HD display, instead of the 5.7-inch Quad HD screen of the XL variant. 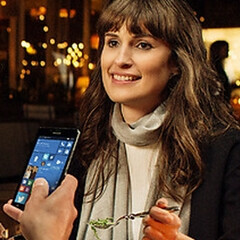 The Lumia 950 offers lots of other high-end features, including iris scanner, a 20 MP PureView rear camera with triple LED flash and 4K video recording, 3 GB of RAM, a six-core Snapdragon 808 processor, 32 GB of expandable storage space, and a 3000 mAh battery with quick charging capabilities. You can find out more about the new Microsoft smartphone by checking out our Lumia 950 hands-on (video included). Off contract, the Microsoft Lumia 950 will cost $549. Do you think this is the right price for the handset? It wont gain much traction if its only available in a single provider. Its easy enough to understand. The Iphone revolutionized Smartphones. Plus Apple fans are diehard. Microsoft won't revolutionize, and they don't have quite as diehard fans. If Its On At&t And Its Not Exclusive, Then It Will Definitely Be Sold By T-mobile As Well. Not necessarily, I honestly doubt it, t mobile focuses on main stream stuff, if anything probably Verizon will carry it. I hope Verizon carries it. From what I have seen there will be a lot of upset customers if they don't. The fact that they only announced the unlocked phones gives me a little hope. If you're with Verizon, I'd seriously suggest you changing providers unless you have an unlimited Internet line. I'm just switching my business line to att to get this phone, and use my passport as my business line and this lumia as my main driver, then switch back to t mobile (they pay for termination fees so I'm good). If anything look into at&t bro. As others have said its not an indication that they will. On Twitter T-mobile announced that the phone is an AT&T exclusive, but they said they welcome anyone to bring in their phone provided that it's compatible with their network. T-mobile has tweeted that it won't be available but that you can bring an unlocked phone to your account. I still haven't seen any authoritative list of bands. That might be the hangup. I've been with T-Mobile since 2007 and on Windows Phone since the beginning until last year with the Xperia Z3. You must be new here. Well you should know better that T-Mobile doesn't carry Windows Phones just because we think they should. Every great Windows Phone I've owned I had to buy unlocked through eBay. This is part of the problem when it comes to Windows phone market shares. They get good phones and no one carries it. It is a catch 22: we don't sell enough so we won't carry it but we don't sell enough because carriers don't carry them. That's true, but I put it on Microsoft to make sure that their device is at least available unlocked and carries the bands that would allow it to run on the greatest number of carriers. That's their best bet and what we're finally seeing happen in the U.S. lately. Hey I'm paying my carrier for the cell signal, the calling and the data. The device manufacturer can and should remain separate, and I should be able to swap out devices as I please. Unfortunately in the U.S. we have Sprint and Verizon, two CDMA carriers which makes them outliers globally. Doesn't help that Verizon and Microsoft have given each other no reason to satisfy the other. Customers get caught in the cross-farting. A story on cnet said that no other US network wanted to sell these. Microsoft took an over 8 billion dollar loss on the Nokia purchase. Microsoft has been busy putting their services on Android and iPhone instead of releasing new Windows phones. It's time to say goodbye folks. Satya Nadella isn't sinking anymore money into cellphones after this. You are completely wrong on this, Nadella has committed to making Windows Mobile devices, the reason the services have been pushed out to more platforms is because Nadella believes that becoming platform agnostic will help bring people over to the platform, and it generates more cashflow. That makes no sense. The platform agnosticism makes sense for a revenue standpoint in the short term, etc. but is utterly nonsensical with the belief it will bring people to W10. Bringing apps like Office over to Iphone and Android will just take away reasons people might consider it in the first place. Under priced compared to an Apple product but probably not for anything else. Keep in mind, they have no issues bleeding money to win the war. The strategy failed hard with the ZUNE but it worked for the XBOX. $549 is definitely not the right price considering the market. Let's see the market: every flagship/HERO device for OEMs for their respective OS has been 649$+ also, no other mobile offers continuum, and certainly not many offer USB type C, in addition to the superior cameras. So yes considering the market it is underpriced. Haha didn't know people were stuck on zune, that's so a decade ago. People don't know those things yet, which is why you have to price it lower until you can begin pricing it fairly. What do you mean "people don't know these things" I get the generalizations that you're implying, but what exactly do you mean? Fair pricing would be 100$ more, you have to remember that this isn't an android, so 8 cores aren't required to function properly. In case you were basing everything from its chip set. I sort of agree but I'm willing to take a chance at 549 myself. I've had so many android phones that cost more and had less. Too bad it's $750.00 and $850.00(XL) in Canada. After exportation and currency fluctuations, you pay the same as we do. Or get a from expansys. That much mark up goes well beyond the currency exchange rate I'm afraid. A lot of other flagships out there have a price difference of only about $100 between Can and US, and they're more expensive to begin with.